One-sentence summary: A cheese merchant slash constable has to deal with murders amidst the drama of guild politics, an approaching army, and the return of his old flame. Do I like the cover? : Eh -- it's not my thing but it's done well enough. First line: The small group of horsemen pulled up in front of the imposing sandstone towers of Kinneil House, allowing the riders to survey the scene in front of them. Buy, Borrow, or Avoid? : Borrow or buy, especially if you like historical mysterious with meaty locales and rich ambiance. Why did I get this book? : It got great reviews the first time it went on tour. Review: I enjoy historical mysteries but must say my favorites are often set during times of war - Sam Thomas' Bridget Hodgson (17th century), Janice Law's Francis Bacon (WWII), Philip Kerr's Bernie Gunther (WWII), to name a few. The ordinary horror of murder becomes increasingly meaningful amidst so much other death, and touches on the best and the worst of humanity. I was intrigued by this book after seeing nonstop raves for it following the first HFVBT for it. And since I adored J. Boyce Gleason's Anvil of God, another other fan favorite, I decided to take the 480+ page plunge with this one. 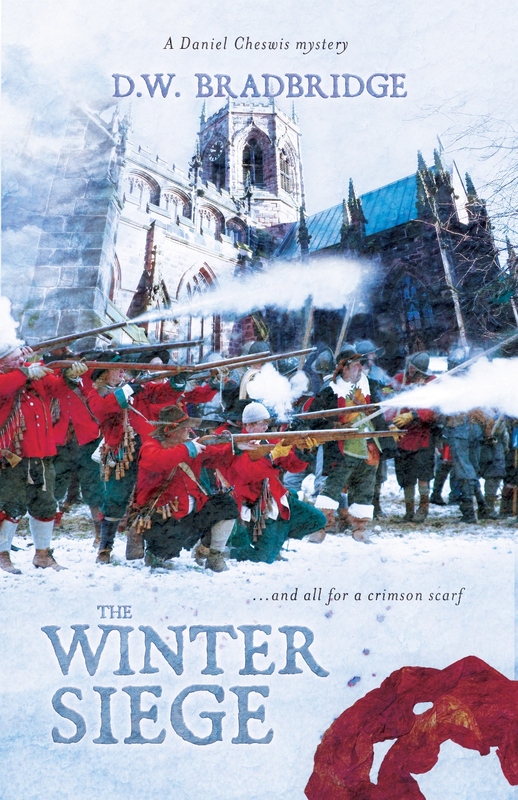 Featuring the same tense wartime era and enclosed urban locale as Thomas' series, this novel takes place during the winter of 1643/1644 during the English Civil War. Set in Nantwich, Cheshire, the story is told by Constable Daniel Cheswis, a cheeseseller and salt works owner. Clocking in at 488 pages, this is a brick -- but it doesn't read like it. In fact, if I was told that in addition to the murder mystery plot and the war time stuff, there was also rich details and subplots featuring the cheese selling business, the drama of salt guilds, and the political press, I might have passed, but Bradbridge makes the pages race. A warm and sympathetic everyman, Cheswis' concern for his community guides him, even if it's a task he's rather not perform. But when faced with not one but two murders, possibly political, both involving friends and family, he finds himself having to navigate the thorny world of politics as well as keeping the peace in the increasingly tense town. Courted on one side by the parliamentary army to keep them apprised of details, the royalist-leaning families of Nantwich are quick to remind Cheswis that they will be around long after the army leaves, urging him to drop any political investigations. Worse, an ex-flame from his childhood appears with her power-hungry printer husband, who is happy to print and distribute inflammatory papers in support of whichever group takes control. Even though there's a thread of political drama, this isn't a politics-heavy novel; despite the wartime atmosphere, it's not a war novel, either. It's a delightful historical novel that draws from the very rich mess of the era, and presents a slice of life that is both ordinary and exotic. The drama of the arduous (but interesting) process of investigating the crime is balanced by enough interpersonal excitement to keep the story from feeling rote or familiar, and I hung on every page. Highly recommended -- can't wait to see what Bradbridge releases next! I'm thrilled to offer a copy of The Winter Siege to one lucky reader! To enter, fill out this brief form. Open to US, UK, and Canadian readers only. Ends 5/2. This looks fantastic! I love a good book that includes murder mysteries and wartime. And I don't think I've read anything that takes place during this particular war..
Me too -- wartime mysteries are so intriguing! This one is really memorable -- worth getting!